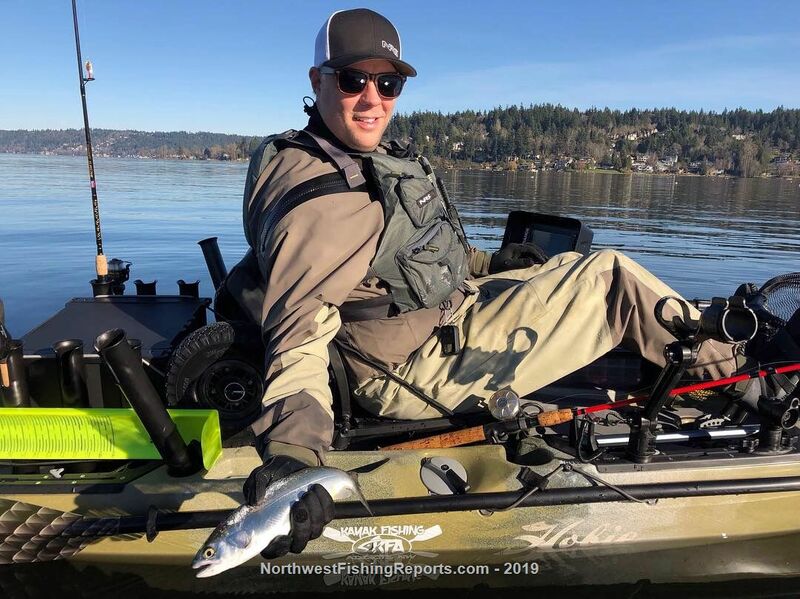 Lake Sammamish delivered again! Sunday was the first time I could get on the lake since New Year’s Day. Met up with a friend at the launch around 10 AM. He's a bass angler and never trolled from his kayak before. 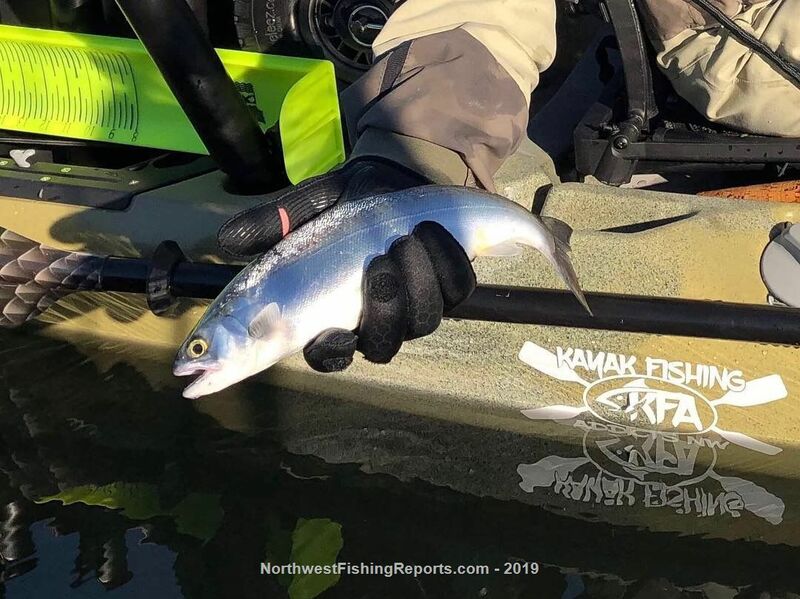 I loaned him an Okuma Coldwater reel paired up with an Okuma Kokanee Black rod. It is spooled up with 18-pound lead core line and 50 feet of 12-pound fluorocarbon. We headed directly north from the ramp. I'd heard the fish were moving farther up the lake from where I'd found success a couple weeks ago. That was the case as we passed the slow wake buoys on the east side and found no takers. I noticed the birds were congregating up by the weather buoy, so we headed out there. We got about midway to buoy when the first fish hit my Tassie Devil lure. It was a small cutthroat under 10" and good enough to get the day started. My friend got his first cutthroat shortly after that. His was on the small side too, but it was still rewarding to get the first one to the boat. The midges were getting thicker as we got closer to the weather buoy. 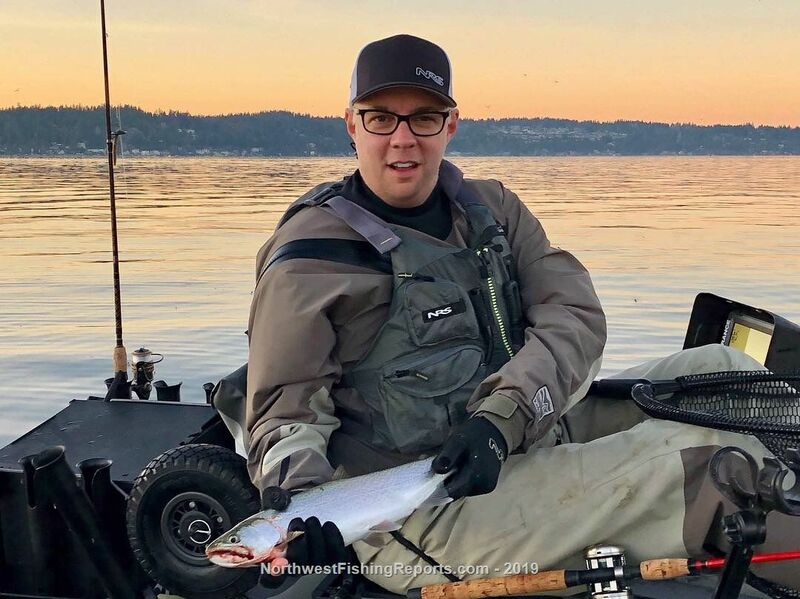 I started working the area around the buoy and landed a couple more fair-sized cutthroats before getting my first coho salmon. It was a beautiful fish. Confirmed the adipose fin was clipped but still released her to grow up more. My friend pedaled away to check out some docks. He’s still a bass guy in his heart of hearts. I ran into some other friends on the water, and they were having success in the same area around the buoy. The powerboats were working it too. I ended the day with six cutthroat trout and 1 coho. All of them returned to Lake Sammamish. The best two cutthroat measured around 18” on my hawg trough. I also picked a perch on a drop shot while taking a quick break from pedaling. The Tasmanian Devil lure was very effective once again. Both the Bloody Ripper and Bleeding Frog colors worked for me. My friend landed a couple using the Rainbow Trout pattern. It was great to see 9 or 10 kayak anglers on the water Sunday. Our sport is growing quickly here in the PNW. If you have not fished from a kayak yet, I encourage you to give it a try. It’s an amazing way to experience our local water and very effective as a fishing platform. Just remember to always wear a PFD. A drysuit is also a must this time of year. View other reports from cdflett. Nice Chris, glad you guys got some after what I reported to ya. I’m not down deep enough it seems. Went out tonight via Vasa Park with my first go with lead core line. Good action approaching the buoy. I think I am deeper now! Alomist 4 colors! Thanks, Bob. Great to see you out there again. It took a little while, but they finally started biting. I think you'll have better results using leadcore. I've been catching most of mine using three colors. Sometimes two or four will work too. The Tassie Devil also has some weight to it. I'll pause my pedaling from time-to-time and get hit as it sinks. I also switch out the treble hook on the Tassie Devil with a #4 siwash hook. Thanks Chris....I got action on the 7 gram version as well as the 13. Nice catch! @TMBob @cdflett What color Tassie Devils do you guys use or prefer? Thanks FishRman. I've had the best luck with the Rainbow Trout, Bleeding Frog, and Christmas Tree patterns.